So you want to run a DrupalCamp in your town? Well, reflecting on the experience of helping to organize and facilitate DrupalCampToronto, I have a few ideas to throw into the pot. 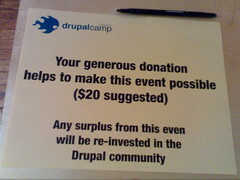 By most measures, DrupalCampToronto was a success: the event was at capacity, there was a fantastic mix of people, the presentations were excellent, and we raised a bunch of money for the Toronto Drupal community. Add to the ingredients that it was relatively easy to put together and that our organizing team was doing it off the side of their desks, and you've got a pretty good recipe for low-stress face-to-face learning events that help to build the Drupal community. All of that said, I feel that we could have tried a few things that would have made the event even better. As one of the conveners of the Web of Change gathering, I've had the opportunity to work with a team of top-notch facilitators over the last couple of years. Also, having had the opportunity to work closely with folks like Mark Surman, Katrin Verclas, and Allen Gunn on events like Penguin Day Toronto and the Human Rights and Technology Conference at MIT, I've certainly experienced my share of the leading edge of facilitation innovation. Power dynamics: Mark reminded me of what a great job Allen Gunn (often called just Gunner) does at facilitating a group's power dynamics — that is the interplay of personalities in the room. He will often set up simple rules that got a long way toward minimizing the negative dynamics, for example rules that encourage people to sit with those that they don't know, or that discourage monologging during a session. He'll also work to identify personalities that he can rely on for in-session facilitation, either people that are good at drawing people out of their shell, or people that would typically monologue and giving them a role that limits their ability to do that. He also leverages a liberal amount of humour and mockery to ensure that folks don't take anything to seriously. Facilitation: All this, however, points to one thing — even unconferences need good facilitation. Okay: so you already knew that! But, in reflecting on my post about the opportunity for progressive unconferences, I was trying to define what makes an unconference different than a conference that uses Open Space Technology; and my conclusion was that unconferences didn't need to invest financially in Open Space facilitators — meaning that just about anybody with enough interest can dream up, organize, and facilitate an unconference. And therein lies the weakness of the unconference. At a conference where everyone's a participant (and there are no spectators allowed), it's important to recognize the need for good facilitation to ensure that human nature doesn't rule the day (we've all read Lord of the Flies, right?). To hear the quieter voices — the ones that often don't get heard — we need to help the louder ones recognize the value of silence and the power of listening. Logistics: This one is easy... as straightforward as these events seem, they are going to throw you a few curve balls. Here are some things to remember: if you need two projectors, have three on hand; If everyone brings a laptop for a full-day event, you're going to need a lot of power... so bring lots of multi-outlet power bars; Make sure you have enough forks, as the caterers might not bring any. And, of course, read Zacker's report back and lessons from DrupalCampSF, which helped us greatly (specifically the advice about food was well received by the non-Vegan participants at DrupalCampToronto). If I were to do it again, I would allow about twice as much time for the logistics. Timing: Finally, the one bit of advice that we didn't take from Zacker that we should have was the bit about busy people trying to organize an event in two weeks. No matter how unconference you get, if you want your participants to have a good time, be comfortable, have opportunities to meet new people, and to (most importantly) learn something new — you have to have time to organize the event properly. Given the relatively small amount of time invested in planning DrupalCampToronto, I think that the organizers did a fantastic job. However, I suspect that we all agree it would have been better if someone could have dedicated one week of full time attention to it. Organizing sponsorships, catering, on-site logistics, and then working with participants to ensure that they have what they need (e.g., T-shirts) takes time and energy. As I head off to BarCampTdot today, I'll be wearing my facilitators hat and taking notes. Hopefully, what comes of all this work around self-organizing events and unconferences is a resource that can be used to keep improving these types of events for the participants and for the organizers. Perhaps, given the Wiki-fied nature of the BarCamp movement, there will eventually be a resource similar to Aspiration's facilitation wiki that can be used to organization progressive unconferences across Canada. Now: go look at some photos and blog posts tagged with drupalcamptoronto!